Fragrant grains of sandalwood are polished with the sweetness of balsamic richness. 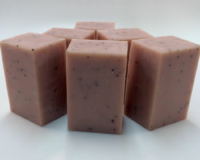 This Sandalwood Soap is topped with beautiful, handmade soap rose petals. Enchanting notes of deep mahogany lie in the heart of these precious woods. 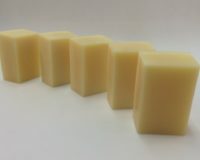 This handmade soap bar has Kaolin Clay which is a cleansers that aids in removing dead skin. Packaging: All soaps are packaged in an organza bag and are Gift Ready.